During my recent trek to Nepal I learned a really fun card game from my Nepalese friends. The game is called Dumbal and pretty much everyone in Nepal knows how to play it. Although the rules are quite simple it's a really fun game to play and we spent hours every day playing it. Especially the fact that the personality of the players comes into it makes it interesting and also because you have to change your strategy as a round gets closer to the end. The game can be played with 2+ players. It's really good for 4-6. Leave the rest of the cards on a stack in the middle. Finish a game by getting the lowest points of all the players in hand. All cards are worth their face value. A is 1 point, J=11, Q=12, K=13. You are allowed to finish when you have 5 points or less, but you don't have to. E.g. you can decide not to finish if you have only 4 points and wait until you have even less. Rounds are played clockwise, the person left from the person dealing the cards starts. 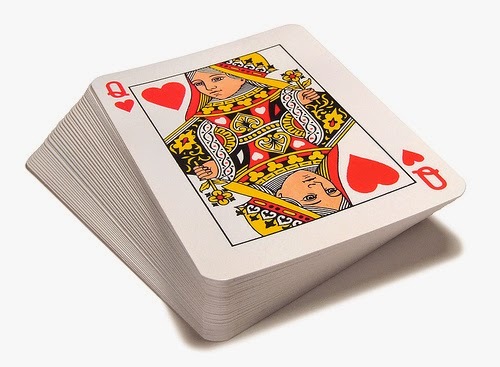 You first dispose (openly) of 1 or more cards from your hand by putting them in front of you. If you dispose of more than 1 card they have to be the same rank (e.g. two 9s, 4 Qs) or a sequence of at least three (6,7,8 of the same suit or Q,K,A,2 of the same suit etc). Then you need to pick up 1 card, either by picking from the (openly visible) cards disposed by the player to your right during his/her last round or from the stack of unused cards in the middle. After disposing and picking up 1 card, the player to the left gets a go. Note that it can happen that you dispose all the cards in your hand. But this means you still have to pick up a card. If you have less than 5 points in your hand you can end the game, but you don't have to. You end the game at the start of your turn by showing everyone your card(s) - note that you will always have at least one card in your hand at the start of a turn. If you have the lowest hand you win the game and get 0 points. Everyone else gets the amount of points they have in their hand. If you ended the game and someone else has the same amount or less points you don't win but that person does. You will get your own points plus a penalty of 20 points. If there is more than one player with less points the lowest wins. In case of a draw the on with the least cards wins. You can also end the game before the very first round if you have 15 points or less in your hands. Same penalty rule applies if someone else has less than or equal points as you. Add everyone's scores up on a piece of paper and repeat the game until you've reached the set amount. The first one to reach the set amount is out and cannot continue playing. The remaining players continue until another person reaches the set amount and so on. The last one standing is the winner.